This lesson covers cables. Fiber optic cable provides protection for the optical fiber or fibers within it appropriate for the environment in which it is to be installed. 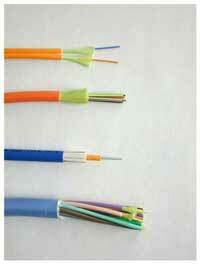 Cable refers to the complete assembly of fibers, strength members and jacket. Fiber optic cables come in many different types, depending on the number of fibers and how and where it will be installed. It is important to choose cable carefully as the choice will affect how easy the cable is to install, splice or terminate, what it will cost and how long it will last in the field. The tutorial is a short presentation on fiber types and their applications. The Virtual Hands-On presentation shows how types of fiber cable are prepared for installation and splicing or termination.